The British Chamber has organised a networking breakfast for its members on Tuesday 7th May 2019 at the Capital Club. To book your place: Please email events bcckenya.org by Tuesday 30th April 2019. Due to the limited seats, confirmations will be acknowledged on first - come basis. Venue Kilimanjaro Room (6th Floor), The Capital Club, Westlands. Map here. Payment Mpesa Till No.1 2463, Cheque in name of - British Business Association of Kenya or by credit card here. Over the course of City Week 2019, a highly eminent faculty of international speakers will explore crucial themes, including their economic and market impact. Guest Passes for International Delegates (domiciled outside of the UK). To apply for your place, please visit the City Week website at https //www.cityweekuk.com/2019 and register as an ‘International Delegate’. The British Chamber, in conjunction with RSM Eastern Africa LLP has organised a networking lunch for its members on 23rd May 2019 at the Mombasa Yatch Club. To book your place: Please email events bcckenya.org by Thursday 16th May 2019. Date and Time: Thursday, 23rd May 2019 - 12:30pm to 2:00pm. These primary challenges encountered by affordable housing developers, architects and consultants are highly complex and interdependent which makes them impossible to be solved by a single body The Affordable housing Investment Summit which is set to happen on June 26-27, 2019 at the Radisson Blu, Nairobi Kenya addresses these issues through various stakeholders including Government officials, investors, financial bodies, REITs suppliers, project developers, architects, consultants who will be present at the event. There will be more than 5 angel investors and venture capitalists from all over the globe who are seeking potential investments in the affordable housing sector across Africa. Key features on why you should attend AHIS 2019? Exclusive ‘Exhibition Area’ where the leading solution providers will showcase their latest and innovative products for Affordable Housing. Exclusive to Delegates, Speakers and Solution Providers this represents an immense opportunity to establish long-lasting business connections with the top-notch industry representatives, all within a social and relaxed environment. Register Here to avail the early bird offer. To gain more information, you can call at + 4 20 3455 4255 or write at ahis@gbbventure.com and copy memberservices@bcckenya.org. The 4th Africa Road Infrastructure and Investment Congress 2019 (#ARIIC 2019) is the continent’s most prominent event which brings together the key financiers, investors, multilateral investment institutions, Government ministries, regulators, public and private sector stakeholders to discuss how these various elements fit together and how to successfully fund and execute infrastructure projects on time and within budget. Taking place in Nairobi, Kenya from 10-11 September 2019, the Congress this year will explore the theme "Boosting Investment in Road Infrastructure". The Congress will analyse new public-private partnership projects (PPPs), new infrastructure projects that promote regional integration and competitiveness of countries, new technologies and financing challenges in the road and highway industry across Sub-Saharan Africa. The event will feature 30+ senior key opinion leaders from the full spectrum of players in the value chain from investors, banking institutions, Government officials, road agencies, construction companies, engineering firms, producers, refineries and all those that supply into them. They will share their experiences, via keynote addresses, panel discussion and case study presentations. We challenge you to participate in the discussion with Q&A sessions being held after each of our sessions! In addition to the implications of road development and investment, we will be exploring new and cutting-edge technology that is increasing the performance of road applications, where recycled materials are being used to great effect and how micro surfacing and crumbed rubber technology is making it easier for roads agencies to maximise existing funds to achieve more. on 26th March 2019 from 8:00am to 10:00am at Intercontinental Hotel Nairobi. Mrs Anne Mutahi, SME Advisor in Kenya, Office of the President. Attendance is free for BCCK members. The Association of Corporate Treasurers in co-operation with British Chamber of Commerce Kenya is delighted to invite you to the ACT East Africa Treasury Forum taking place on 13 March 2019 in Nairobi, Kenya. This established industry event supports growth and continued development of the treasury function in East Africa and provides a voice for treasury and finance professionals. With inflation and exchange rate trends indicating macro-economic stability for the growing treasury function, make sure you join the region’s only one-day conference with the experts who are leading treasury in dynamic markets. What to expect from the event? The event is FREE TO ATTEND for corporate treasury professionals*. *Processionals from banks/financial institutions/consultants and all other business service providers will receive a 20% discount with the code above. The British Chamber has organised a networking breakfast for its members. Our guest speaker will be Mr Nick Nesbitt, Chairman of East African Business Council appointed in June 2018. During his appointment, Mr. Nesbitt called on the government to improve the business environment to support the operations of the Private Sector to thrive regionally. He also called for improvement of technological infrastructure to fast-track free movement of goods and services in the region. Mr Nesbitt will be speaking to our members on how to increase competitiveness and expand their businesses in East Africa. There will be an interactive session for members to discuss the challenges of doing business regionally with the East African Business Council Team. To book your place: email events bcckenya.org by 4 00 pm Friday 18th January 2019. Date and Time: Tuesday, 22nd January 2019 - 7:00 am to 9:00 am. Venue Sankara Nairobi, Westlands. Map here. Cost Ksh 2,800 for breakfast buffet, tea and coffee. Payment Mpesa Till No.1 2463, Cheque in name of British nbsp;Business Association of Kenya or by credit card here . To book your space email events bcckenya.org by Monday 3rd December, specifying (for booking purposes) whether you or your guest are also members of the Muthaiga Country Club. Cost Corporate table of 10 pax KSH 40,000, Individual Members KSH 4,500 and KSH 5,000 for non-members. Payment options: Via Mpesa Till No.172463, Cheque in name of - British Business Association of Kenya or credit card here. The British Chamber Coast Chapter Board would like to invite you to join them for dinner on 15th November 2018 at 7.00pm at the residence of one of the members. Venue to be sent upon confirmation. This will be an opportunity for you to meet and network with the Coast members and a formal introduction to the newly elected Vice Chairperson Ms.Priya Chana, who joined the BCCK Coast Chapter Board in September 2018. RSVP to events@bcckenya.org by 4.00pm Tuesday 13th November 2018. Kindly let us know if you have any food allergies and any other dietary requirements. The British Chamber of Commerce has partnered up with Linguarama England, the number 1 ranked business English specialist in the UK to bring to you Nairobi’s very first English for International Business course. The course is designed to develop business professionals English for use in international meetings, presentations and negotiations. A specialist native English trainer will be flying out exclusively from London to Nairobi to conduct the training. WHAT SHOULD BE AT THE TOP OF EVERY CEO's AGENDA FOR GROWTH AND SUSTAINABILITY? To book your place: email events bcckenya.org by 4 00pm Monday, 1 th October 2018. Cost Ksh 3,000 for breakfast buffet, tea and coffee. Payment Mpesa Till No.1 2463, Cheque in name of British nbsp;Business Association of Kenya or by credit card nbsp;here. RefuSHE nbsp;(formerly Heshima Kenya) will be celebrating their 10th Year Anniversary on 4th October 2018 from 6.00pm. The evening celebration will feature a fashion show highlighting the unique hand-dyed textiles made by artisans in RefuSHE’s economic empowerment program. RefuSHE is the first and only organization of its kind providing holistic services to unaccompanied refugee women and girls in Nairobi. The organization provides short and long-term support for young refugee women and their children through safe shelter, education, case management and counselling, economic empowerment, community outreach, and legal advocacy support. Bonds, Loans & Sukuk East Africa is East Africa’s only annual debt finance event covering developments of both on- and off-shore markets. With an audience of over 250 government officials, corporates, banks, funds & advisors, it is the premier event connecting fund raisers with lenders and investors active within the East African capital markets space. The event is a unique opportunity to hear from over 30 key industry speakers; uncover the capital markets straegy of leading corporate and project companies; schedule private 1-to-1 meetings with the region’s most active issuers; and gain direct insight into the way technology is being used in the debt capital markets. Don’t miss your only opportunity to connect with all of your key clients, targets and peers active across the sub-region under one roof in Nairobi this October. The British Chamber has organised a networking lunch for members on Thursday, 26th July 2018 at Tamarind Mombasa. Our guest speaker will be Mr. Samuel Helu - Programme Manager, Mombasa from TradeMark East Africa. 1 :50pm - 2:00pm - Closing remarks by British Chamber Coast Chairman, Mr.David Mackay. Cost Ksh 2,500 for members and non-members, for lunch, tea and coffee. Payment Mpesa Till No.1 2463, Cheque in name of British Business Association of Kenya or by credit card here. The British Chamber, in conjunction with PricewaterhouseCoopers has organised a networking breakfast presentation for our members. PwC will give budget highlights on direct tax measures impacting foreign investors. This will include Profit remittance and dividends, Withholding taxes, Transfer Pricing and Double Tax Agreements. They will also give updates on indirect tax changes impacting foreign investors and tax amnesty. To book your place: Please email events@bcckenya.org by 12:00pm Tuesday, 11th July 2018. Venue: Kilimanjaro Room (6th Floor), The Capital Club, Westlands. Map here. Cost: Ksh 3,000 for breakfast buffet, tea and coffee. Payment: Mpesa Till No.172463, Cheque in name of British Business Association of Kenya or by credit card here. To book your place: Please email events@bcckenya.org by Tuesday 12th June 2018. Global Trade Review (GTR) marks ten years in Nairobi with the East Africa Trade & Commodity Finance Conference 2018, the EAC’s most comprehensive gathering of commodity producers, traders, corporates and financiers. BCC Kenya have secured a limited amount of free corporate passes (available for exporters, importers, distributors, manufacturers, producers and traders of physical goods only) these passes will be available on a first come first served basis. Reserve your free Corporate pass here! In addition, any other registrations made can receive a 15% discount with code BCCKENYA15 when booking online. Please keep in mind that these offers are not available in conjunction with any other offers and are eligible for new registrations only. Finance sector perspectives: A return to optimism for 2018? Notwithstanding political risks and structural finance sector challenges impacting the region, a wealth of business opportunity is available to those with an understanding of East African business. For media accreditation, or for more information, please contact Elisabeth Spry on espry@gtreview.com and copy Francis Masika on events@bcckenya.org. The British Chamber in conjunction with Salama Fikira will be hosting a security briefing networking breakfast for its members on Thursday 17th May 2018. The briefing will be on the Kenyan business environment, security issues, and opportunities. The presentations will be done by Salama Fikira, Group CEO, Mr. Conrad Thorpe OBE, and Managing Director Kenya and Horn of Africa, Mr. Dylan Evans, complemented by a commentary from The British Deputy High Commissioner, Mrs. Susie Kitchens. Following the presentations, there will be an opportunity for questions and general discussion. If you would like to attend the security briefing networking breakfast, kindly RSVP to events@bcckenya.org by COB 14th May 2018. Venue: dusitD2 nairobi - see map here. This event is sponsored by Salama Fikira and is open to members only. There are limited seats available and reservations will be on first come, first served basis. The British Chamber in conjunction with KK Security has organised a security briefing lunch event for its members and guests at Tamarind Mombasa. The briefing will be delivered by the newly appointed Managing Director for KK Security, Mr Chis Manning. To book your place: Please email events@bcckenya.org by Wednesday 25th April 2018. Cost: Ksh 2,500 for members and Ksh 3,000 for non-members, for lunch, tea and coffee. Now in its eighth year, City Week is the premier gathering of the international financial services community. It brings together industry leaders and policy makers from around the globe to consider together the future of global financial markets and London, in particular. It consists of two days of cutting-edge conferences, workshops, social events and networking opportunities, with other satellite events being held later during the week. BREXIT: What does the UK need from an FS Chapter of a Free Trade Agreement with the EU? Where next for global financial regulation? For a complete list of speakers click here. To apply for your place, please visit the City Week website at https://www.cityweekuk.com/2018 . Alternatively send an email to the City Week team at cityweekuk@cityandfinancial.com or call +44 (0)1932 340115. The British Chamber and the Department of International Trade (DIT) invite you to attend a Networking Breakfast on 12th April 2018 at InterContinental Nairobi. Our guest speakers will be VIP guests from the British and Kenyan Governments. The theme of discussion will be on "Trade and Investment opportunities in Kenya and the Big 4". The event will also mark the signing of an MoU between the British and Kenyan Governments. The MoU will strengthen the partnership between both countries. The Kenyan government will introduce their "One-Stop Centre" a streamlined contact centre that looks after investor issues. Senior representatives from the "One-Stop Centre" regulators including the KRA, NEMA, Department for Immigration, Business Registration Unit, EPZ, Nairobi County on single business permit, Kenya Power and Federation of Kenya Employers will be present at the event. There will be an opportunity for you to network with the senior officials of the regulators and raise any issues. If your business has specific issues relating to one of the above regulators, please send to memberservices@bcckenya.org prior to the event. To book your place: Please email events@bcckenya.org by Monday 9th April 2018. Venue: InterContinental Nairobi, City-Hall Way, Nairobi. The British Chamber has organised the next networking event for its members on 23rd February 2018 at English Point Marina, Mombasa. Our guest speaker will be The Deputy Governor of Taita–Taveta County, H. E. Majala Mlagui. The Deputy Governor will speak on the Jumuia ya Pwani initiatives and objectives for business at the Coast and areas of cooperation between Kenya and the United Kingdom. The Deputy Governor will most likely be accompanied by other Deputy Governors from Kilifi, Tana River, Lamu, Kwale and Mombasa Counties. 12.25pm - 12.30pm - Welcome note from BCCK Coast Chairman Mr.David Mackay. 12:30pm - 12:50pm - A brief presentation from Mr.Daniel Ngumy from Anjarwalla and Khanna on the Common Reports Standards and Amnesty. 12:50pm - 1:00pm - Keynote speech from BCCK Chairman Mr.Graham Shaw on UK and Kenya business growth. To book your place: Please email events@bcckenya.org by Tuesday, 20th Feb. 2018. Cost: Ksh 2,200 for members and Ksh 2,500 for non - members. The event is organised by the Association of Corporate Treasurers, and is the only event series in the region delivered by a Royal Chartered professional treasury body. With an active global network of 7,000 members and students, the ACT is the authentic voice of the treasury profession providing internationally recognised qualifications and industry standards. The second ACT East Africa Treasury Forum, 7 February 2018, is must-attend - enabling treasury and finance professionals to have increased impact and add further value to their organisations. One of our guest speakers will be Dr. Patrick Low, Asia Global Fellows Program Director at the Asia Global Institute and Former Chief Economist at the World Trade Organization (1997 - 2013), see Bio here. To book your place: Please email events@bcckenya.org before 10th January 2018. Due to the limited seats, confirmations will be acknowledged on first - come basis. Payments through credit card here. Kindly send your payment with confirmation. The Annual General Meeting for British Chamber of Commerce Kenya will be held on Friday 8th December 2017, at the Muthaiga Country Club, Nairobi. The formal calling notice and agenda for the AGM is here. A proxy form for those who are unable to attend can be found here. Our guest of honor at the AGM will be the British High Commissioner H.E. Mr. Nic Hailey. The AGM will start at 12.00 pm. The AGM is restricted to members only. The Chairman and Directors of the British Chamber of Commerce Kenya request the pleasure of your company at the Chambers Christmas Lunch, to be held on Friday 8th December from 12.30pm to 3.00pm at the Muthaiga Country Club, Nairobi. A three-course meal, inclusive of tea / coffee, will cost KSH 4500 for members, KSH 5,500 for non-members, there will be a cash bar for drinks at the venue. RSVP to events@bcckenya.org by Wednesday 6th December, specifying (for booking purposes) whether you or your guest are also members of the Muthaiga Country Club. The British Chamber has organised a networking breakfast for its members and guests at the English Point Marina hotel. The theme and discussions will be: "The performance of Kenya tourism in 2017 and plans for 2018". Our guest speaker will be Mr Mohammed Hersi, Chairman of the Kenya Tourism Federation board and CEO of Sun Africa Hotels. To book your place: Please email events@bcckenya.org by 29th November 2017. Payment: Mpesa Till No.172463, Cheque in name of - British Business Association of Kenya or by credit card here. Food &Drink East Africa is the first trade exhibition in the region that is solely focused to the food and beverage industry. For suppliers of consumable products, the event will attract buyers from supermarkets, hotels, restaurants, cafés, bars and wholesalers who are looking for new products and international suppliers. Running alongside Hostex East Africa, the show is the principal event for food buyers. Hostex has been running since 2013 and is the only dedicated hospitality trade exhibition in the region. Local and international suppliers will bring catering equipment, table ware, bathroom and spa products as well as anything else that goes into a hotel or restaurant. The hospitality industry in Kenya has gone through a period of change in recent year but with more hotels in development and a resurgence in tourism, the event continues to do well. The British Chamber has organised a networking breakfast for its members on November 24th at the Radisson Blu Hotel, on Upper Hill. To book your place: Please email events@bcckenya.org by 22nd November 2017. Kindly send payment with your confirmation. The European Business Associations, Chambers of Commerce and various European Embassy trade services in Kenya are in the process of establishing an umbrella organization that will represent European Businesses in Kenya. The organisation being formed is called "European Business Council in Kenya". One of the objectives of this organisation is to encourage networking opportunities between European Businesses operating in Kenya. The European Business Council have organised the very first European Business Networking cocktail on 9th November 2017. To book your space please RSVP to events@bcckenya.org by 8th November 2017. Come meet your European counterparts and potential business partners! The event is co- sponsored by Park Inn by Radisson and they have offered interested participants a tour of the hotel. Securexpo East Africa is the largest commercial and homeland exhibition and conference that occurs in the region. With 70 exhibitors, over 2000 trade visitors and supported by the major local trade associations, the event has helped bring new technologies and better security to Kenya and the wider region. Exhibiting companies encompass the whole security sector. From Access Control, Surveillance, Perimeter Fencing, Biometrics, Cyber Security and many more, the event is a one stop shop for corporations security needs. Co-located within Securexpo, K-OSH and Firexpo run to cater for the safety and fire markets respectively. The roundtable meeting will be highly beneficial in providing insights on the political views of the government on various issues with a focus on the Economy, Tourism and Security. This is short notice, let me know if you would be interested in attending as soon as possible, we will secure a limited number of 20 members. Grateful if you can RSVP your confirmation before 5.00pm today. We cordially invite you to attend our panel discussion on 10th October in Nairobi. This event is led in collaboration between Turner & Townsend Kenya and the International Project Finance Association (IPFA). Africa has for some time been an investment destination of choice for international investors, financiers, project developers and EPC contractors involved in capital project development. International professional firms such as project controls and project management experts, legal advisors, engineers and architects are also following suit as their clients go into the region off the back of projects. We want to discuss how better collaboration between local and international companies can make projects easier and more attractive to investors and at the same time act as a catalyst to develop local businesses. Jersey Finance is delighted to announce that we will be hosting a series of 2017 Africa private wealth events entitled ‘Jersey: A Valued Partnership’. We would be delighted if you, or your professional contacts with a similar interest in Africa, could join us at our Nairobi event on Tuesday 3 October at PwC Tower, Nairobi. Led by Allan Wood, Business Development Director, Jersey Finance, this breakfast event will provide plenty of opportunities to network, and will feature speakers and panellists who will offer fresh insights into several topics, including the effect of recent UK measures effecting offshore ownership, succession planning, CRS and Kenya’s tax amnesty. This year’s speakers will include Rachel Bentley, PwC (South Africa); Stephen Whale, JTC Group (Jersey); Claire Machin, Helm Trust Company Limited (Jersey); and Michael Mugasa, PwC Kenya (Nairobi). The event will also feature a panel session, entitled ‘Wealth Structuring in a Transparent World’, which will explore a number of recent topics and trends affecting Kenyan families and their advisors. Panellists will include Gareth Harrison, PwC (Nairobi); Claire Machin, Helm Trust Company Limited (Jersey); Stephen Whale, JTC Group (Jersey); Lindsay Bateman, Brooks Macdonald Asset Management (International) Limited (Jersey); and Elizabeth Henson, PwC (London). To view the full agenda and list of speakers, please click here. This event is set to attract a broad range of members of the local advisory community, including wealth practitioners, lawyers, investment managers and other finance professionals, and we encourage you to register early to avoid disappointment. Please feel free to share this email with any of your colleagues or professional contacts who may be interested in attending this event. If you have any queries, please contact Georgina Matthews. The British Chamber has organised a networking breakfast for its members on 21st September at the Capital Club. Our guest speaker will be The Deputy Governor of Nairobi County, Mr Polycarp Igathe. The Deputy Governor will speak on the business objectives of the newly elected County Government, and how to build and strengthen the business relationship between Kenya and the United Kingdom. We would like to congratulate Mr Polycarp Igathe, who was the CEO of Vivo Petroleum and became a Sterling member before his move into the political arena. We are proud and honoured to have him speak to our members on how we can partner and support the County Government in improving the city of Nairobi. To book your place: Please email events@bcckenya.org by 19th September 2017. Due to the limited seats, confirmations will be acknowledged on first - come basis. Venue: Kilimanjaro Room (6th Floor), The Capital Club, Westlands. Business Association of Kenya or by credit card here. The Department for International Trade (DIT) invites you to the leading exhibition for the Waste, Energy, Recycling and Water sectors. As a DIT hosted buyer, you will receive a personalised programme to meet and do business with innovative UK companies matched to your procurement needs. Download the Expression of Interest (EOI) form here and apply to become a DIT International Buyer at RWM and connect with businesses showcasing the latest in resource management technology. The British Chamber has organised a networking breakfast for its members at the Tamarind Mombasa. The British Chamber in conjunction with WS Insight (K) Ltd will be speaking around the Kenya elections and preparedness. There will also be a presentation from a guest speaker from Trade Mark East Africa (TMEA), Mr. Ahmed Farah - Country Director, Kenya. He will be talking on TMEAs perspective on the Agri - Business sector in Kenya. If you would like to attend the breakfast, kindly send your confirmations to events@bcckenya.org by 18th July 2017. Payment options: Via Mpesa Till No.172463, Cheque in name of - British Business Association of Kenya or by credit card here. Kindly send payment with your confirmation. The British Chamber in conjunction with G4S Kenya Ltd and WS Insight (K) Ltd will be hosting a security briefing breakfast event for members on Friday 14th July 2017. The briefing will be around the Kenya elections and preparedness. There will be a panel discussion after the presentations from our sponsors. If you would like to attend the security briefing breakfast, kindly RSVP to events@bcckenya.org by 12th July 2017. Venue: Sankara Nairobi - see map here. This event is open to members only and there will be no charge. Limited seats available. The British Chamber, in conjunction with KPMG, has organised a networking breakfast for our members and their guests. KPMG will give an overview presentation of the Kenya Bribery Act 2016, and its implications on businesses. Our guest speaker from KPMG, Mr. Simon Dwyer - Head of Forensic in East Africa, has over 20 years’ experience in fraud and financial investigations. To book your place: Please email events@bcckenya.org by 19th June 2017. Cost: Ksh 3,000.00 for members and Ksh 3,500 for non - members (The cost is for buffet breakfast, tea and coffee). 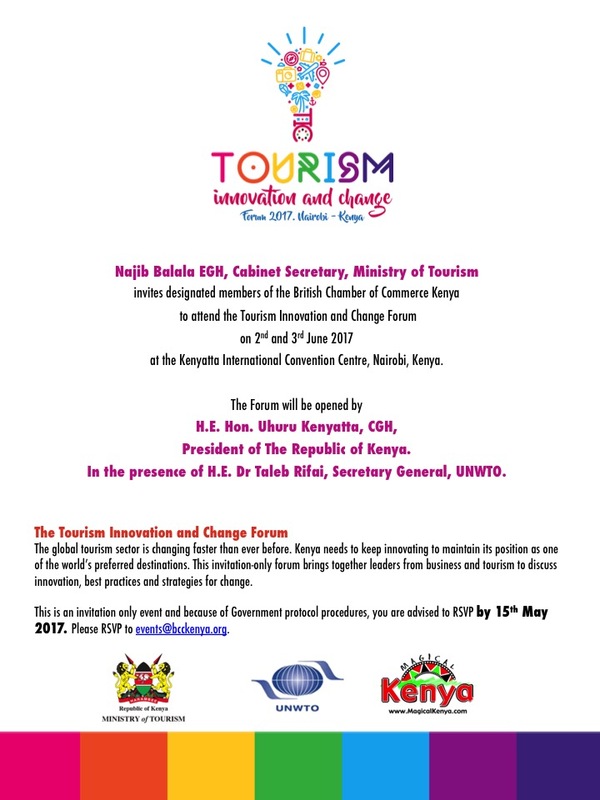 02 Jun 2017 - Tourism Innovation and Change Forum 2017 Nairobi, Kenya. The British Chamber / British High Commission, in conjunction with Kroll, will be hosting a security briefing on Thursday 20th April to discuss the role of the Board and General Council in preparing for cyber breach incidents. Speaker from Kroll will be Andrew Beckett - Managing Director, EMEA. The topic will be on cyber security and the role of the Board and General Council in preparing for cyber breach incidents. There will also be a commentary from the British Deputy High Commissioner, Dr John Murton. Following the presentations there will be an opportunity for questions and general discussion. If you would like to attend the breakfast, kindly RSVP to events@bcckenya.org by 17th April 2017. The British Chamber has organised a networking breakfast for its members and guests at the Mombasa Club. The theme and discussions will be around the update on Kenya Ports Authority and development on the Standard Gauge Railway (SGR). The Coast Chairman, Mr David Mackay will lead the discussions with a guest of honor from Kenya Ports Authority. If you would like to attend the breakfast, kindly RSVP to events@bcckenya.org by 29th March 2017. The Annual General Meeting for British Chamber of Commerce Kenya will be held on Thursday 9th March 2017, at the Residence of the British High Commissioner in Muthaiga, Nairobi. A proxy form for those who are unable to attend here. Minutes for the last AGM here. H.E. Nic Hailey the British High Commissioner will welcome the Members and the AGM will be held. Propak East Africa is a packaging, printing and plastics exhibition and conference that attracts over 100 local and international exhibitors and nearly 3000 trade visitors. Supported by the Kenya Association of Manufacturers and the Institute of Packaging Professionals of Kenya, the event is the largest of its type in the region and the principal gathering of industry leaders. The event has run since 2014 and has sister events in South Africa and Nigeria, each of which are the market leading events. It is with great pleasure that we announce the launch of British Chamber of Commerce Kenya Coast Branch in Mombasa. The British Chamber request the pleasure of your company at a cocktail reception launch in Mombasa. Venue: English Point Marina - Silos Road, Mkomani Nyali Mombasa. We look forward to seeing you, kindly confirm your attendance by 19th January 2017. The British Chamber, in conjunction with PricewaterhouseCoopers and the British High Commission visa department, has organised a networking breakfast presentation for our members and their guests. PwC will present an update on recent changes in the tax and regulatory landscape in Kenya. This will include introduction of tax amnesty for offshore income, tax relief for graduate interns, marine insurance regulations, and the new International Financial Centre. They will also touch on some of the expected developments for 2017, including a faster Budget timetable and possible new Income Tax Act. The visa department will present on visa application process and give an overview on the categories of UK visitor visas. They will elaborate on what the visas can and can’t be used for, transit visas and exemptions, priority visa service and the visa set up in Kenya / Africa. To book your place: Please email events@bcckenya.org by 17th January 2017. Date and Time: Thursday 19th January - 7.00am to 9.00am. The Chairman and Directors of the British Chamber of Commerce Kenya request the pleasure of your company at the Chambers Christmas Lunch, to be held on Thursday 8th December from 12.30pm to 2.30pm at the Muthaiga Country Club, Nairobi. The Chamber in collaboration with DeLaRue has organised a tour to DeLa Rue Currency and Security Print factory in Ruaraka at 10.00am on 8th December. If you would like to join the tour, kindly send us your full name, national Identification number and car registration. A three-course meal, inclusive of tea / coffee, will cost KSH 4500 per person, drinks will be bought separately at the venue. - Members are encouraged to bring one prospective member as a guest. - RSVP to events@bcckenya.org by Friday 2nd December, specifying (for booking purposes) whether you or your guest are also members of the Muthaiga Country Club. The British Chamber / British High Commission, in conjunction with Control Risks East Africa, will be hosting a briefing on Wednesday 9th November to discuss the key business risks for 2017. The areas of discussion will range from political and election risk, to cyber and corruption. Speakers from Control Risks will be Daniel Heal - Senior Partner, Maria Knapp - Director, Compliance, Forensic and Intelligence and Wendy Cheshire - Director, Cyber Security, complemented by a commentary from the British Deputy High Commissioner, Dr John Murton. Following the presentations there will be an opportunity for questions and general discussion. This event is open to members only and there will be no charge. If you would like to attend, please contact: events@bcckenya.org by 3rd November 2016. Limited seats available. 01 Nov 2016 - BCC GLOBAL BUSINESS NETWORK LIVE - LEARN. EXPORT. GROW. Ever wanted to get started in exporting and increase your revenue through overseas sales? Maybe you already export, but want to find new markets to sell your product to? Perhaps you started exporting ‘accidentally’ – and want to understand the entire process, from documentation to finding overseas partners? Or, are you simply looking for insights in to the ever-changing export picture, particularly in light of the EU referendum? Whether you are a novice or seasoned exporter, BCC Global Business Network Live is the event that will help you take your business to the next level. The next British Chamber networking event will be a joint luncheon with the German Business Association and American Chamber on 24th October at Radisson Blu Hotel. Cost: Ksh 3,000.00 for members and Ksh 3,500.00 for guests, kindly make all payments before the event. Payment options: Via Mpesa Till No.172463 or Cheque in name of - British Business Association of Kenya. Kindly send payment with your confirmation by 21st October. RSVP: Please email events@bcckenya.org with your confirmations by 21st October. The ABMA Education Learning Environment is a new method of skills training devised to create talented and proficient future employees to drive your organisation forward and achieve your company ambitions. Training and education play an essential role in the generation of business success and it is imperative that good practices are taught and learnt at the earliest opportunity. ABMA Education has been working with leading global employers to address training and skills gaps that are affecting businesses today and we are looking forward to sharing some exciting new developments directly with leading organisations in Kenya. Attendees of the event will be eligible for special training options and offers that will not be available to any other businesses or employers. Time: 7:00 am to 9:00 amTo book: Please email events@bcckenya.org by 7th October 2016, spaces are limited and as such will be issued on a first come first served basis. The Bonds, Loans & Sukuk Kenya briefing day Bonds, Loans & Sukuk Kenya Briefing day 2016, taking place on the 10th of October in Nairobi, Kenya at Villa Rosa Kempinski. The Bonds, Loans & Sukuk Briefing day 2016 is the first and only gathering to discuss capital markets’ solutions to Kenya’s burgeoningInfrastructure, Energy and Financial service sector. British Chamber are supporting partners for this event, a special discount of 20% is applicable for all Members. Or contact Jessica Wheater on Jessica.Wheater@GFCMediaGroup.com for more information. The next British Chamber event is a joint cocktail with Kenya China Economic and Trade Association on Thursday 22nd September. This event is a step forward in building partnerships and enhancing mutual business opportunities in Kenya with our Chinese counterparts. The British Chamber signed a MoU on 19th July with Kenya China Economic and Trade Association. The MoU will see greater collaboration in promoting and strengthening public- and private sector links in Kenya. It will provide a platform for partnerships between British and Chinese companies in Kenya. The Chamber is working with the Association of Corporate Treasurers’ (ACT) on an inaugural conference supported by the Loan Market Association (LMA) on Upscaling Infrastructure, Technology and Enterprise; Opportunities and Challanges for Treasury in Africa. This conference is designed for regional treasury community - doing business locally and globally.This event is free for Corporate Treasury Teams. The British Chamber would like to invite you to attend the Sterling Membership launch to be hosted by the British High Commissioner Mr. Nic Hailey, at his Residence. The Chamber is pleased to announce that Safaricom are proud sponsors of the Sterling Launch. Our monthly networking breakfast for June is with Lord Chadlington speaking on EU Referendum. You dont want to miss what promises to be an interesting and exciting event with Lord Chadlington and your interactions on the EU Referendum. The Annual General Meeting for British Chamber of Commerce Kenya will be held on Thursday 26th May 2016, at the residence of the British High Commissioner in Muthaiga, Nairobi. The AGM is restricted to paid members only. The next British Chamber/British High Commission security briefing will be held on Friday 15th April. This event is sponsored by Warrior Insight and Sankara Nairobi at Sankara Hotel Westlands. Speakers: will be from Warrior Insight covering assessment of security threats to businesses in Kenya complemented by a commentary from the British Deputy High Commissioner, Dr John Murton. Following the presentations there will be an opportunity for questions and general discussion. This event is open to members and their guests (of any nationality) and there will be no charge. Monthly Networking Breakfast: The Kenyan Competition Landscape presented by Mr Francis Kariuki, Director General of Competition Authority of Kenya. Further details to follow. Our monthly networking event for February will be an evening drinks reception hosted by the British High Commissioner at his Residence in Muthaiga, at which we will welcome Lord Hollick, the Prime Ministers Trade Envoy to Kenya and Tanzania. Lord Hollick makes regular visits to the region and is keen to engage with British businesses operating here and with Kenyan businesses who are trading with UK companies. We do hope that you will be able to join us. Please RSVP to events@bcckenya.org by 12 February. There is no charge for this event. Date and Time: Thursday 18th February, 6 to 8.30 pm. Venue: The British High Commissioners Residence, Tchui Road (off Serengeti Avenue), Muthaiga. On the 16th of February Sons of Kemet will give an exclusive performance at the Michael Joseph Centre co-hosted by the British Council and the British Chamber of Commerce Kenya. We have 50 tickets for sale at 2,000 ksh for BCCK members which must be paid in advance via MPESA Till Number 172463. You are in for a night of hypnotic double drum rhythms that frame the colourful interplay of saxophone, clarinet and tuba as the original compositions are brought to life by four fiercely creative musicians. Remember, there are limited tickets available for sale at 2,000 ksh for BCCK members which must be paid in advance via MPESA Till Number 172463. Join us for a night of unforgettable Jazz. Please RSVP to events@bcckenya.org by 12th February 2016. Monthly Networking Breakfast: Economic and Political Stability in East Africa. 0700-0900 at the Capital Club, Westlands. Cost KSH 3000 for members, KSH 3500 for guests of members. Please book via events@bcckenya.org by 18 Jan.
Evening networking reception with the VIP Head of the UK Delegation to the World Trade Organisation and the incoming British High Commissioner. Open to members of the BCCK and KNCCI - no charge for entry. Venue: Sankara Hotel, 6-8:30 PM. RSVP to UKTI.Nairobi@fco.gov.uk by midday on 16 Dec. This years BCCKs Christmas lunch will be held on the 10th December 2015 at the Muthaiga Club. Charges are KSH 4000 per head for three-course lunch; members encouraged to each bring one prospective member as a guest. Please RSVP to events@bcckenya.org by 16 Nov, specifying (for booking purposes) whether you are also a member of the Muthaiga Club. Our monthly networking breakfast for November will feature a presentation by Dr Christian Turner, the British High Commissioner to Kenya. As he nears the end of his tenure as High Commissioner, Dr Turner will give us his perspective on the current state of Kenyan-British trade relations and his predictions for the future. Following the High Commissioners presentation there will be an opportunity for questions and discussion. Date and Time: Thursday 19th November, 0700-0900hrs. Cost (including buffet breakfast and tea /coffee): KSH 3000 for Members; KSH 3500 for Non-Members via cash, cheque or MPESA; paid on arrival. KSH 2800 for Members paying in advance via MPESA (Till Number 172463). Quarterly Security Briefing, Sponsored by Salama Fikira, with presentation on security threats to business by Salama Fikiras risk analysis team, followed by commentary from the Deputy High Commissioner, Dr John Murton. Breakfast meeting, 0700-0900 at The Zen Garden Restaurant. No charge. Please book via events@bcckenya.org by 19 Oct. The next Chamber networking event will be a breakfast at the Capital Club in Westlands, Nairobi on Friday 16th October. Based around the theme of Youth and Entrepreneurship, our speakers will be examining youth-focussed opportunities in Kenya, including Nairobis booming cottage tech digital scene, innovative use of micro-distribution models, and youth business and educational mentoring initiatives. Speakers will include Ravi Shah of Greener Pastures; Hannah Clifford of Nairobi Garage; Arthur Njoroge of The Kuza Project, and Naomi Ngeno from Strathmore Universitys Macheo Initiative. Following the presentations there will be an opportunity for questions and general discussion. Date / Time: Friday 16th October, 0700hrs - 0900hrs. Location: Kilimanjaro Room (6th Floor), The Capital Club, Westlands. Pay on Arrival (cash, cheque or MPESA): 3,000 KSH members, 3,500 KSH non-members. Cost includes buffet breakfast, water and tea/coffee. The next Chamber networking event will be a breakfast at the Capital Club in Westlands, Nairobi on Wednesday 16th September. Lisa Phillips, Head of the British Department for International Development (DFID) in Kenya, will be giving a presentation on Business as Champions of Development, exploring ways in which development agencies and the private sector can partner more effectively. This will be complemented by a short presentation from a Chamber member with experience of aid-funded projects, and an introduction to the work of the International Finance Corporation, part of the World Bank Group. Following the presentations there will be an opportunity for questions and general discussion. Date / Time: Wednesday 16th September, 0700hrs - 0900hrs. Cost: 3,000 KSH members, 3,500 KSH non-members. Includes buffet breakfast, water and tea/coffee. Paid on arrival. The main Chamber networking event this month will be a breakfast at the Intercontinental Hotel, Nairobi on Tuesday 14th July 2015. Anthony Muthusi and his colleagues from Ernst & Young will be giving a presentation on The Recent Kenyan Budget: Implications for Foreign Companies, after which there will be an opportunity for questions and general discussion. Time: 0700 hrs - 0900 hrs. Location: Le Chateau Room (8th Floor), The Intercontinental Hotel. Speakers will be from Control Risks Group, following which the Deputy High Commissioner will provide comment. An exchange of views and information is strongly encouraged. This event is open to members (of any nationality) and there will be no charge. The main purpose of this session will be to answer the questions of those members who are already exploring how they can access UK Export Finance products. Time: Thursday 2nd July, 1300 hrs - 1430 hrs. Cost: 3,500 KSH for members, 5,000 KSH for non-members includes 2 course lunch, water and tea/coffee. The annual joint British/German Chamber lunch will be held at the Serena Hotel on 9th June, from 1200 - 1400 HRS. The keynote speech will be made by Cabinet Secretary for Industrialisation and Enterprise, Adan Mohammed, after which he will join a panel alongside the British High Commissioner, Dr Christian Turner, the Deputy German Ambassador, Friedo Sielemann, and the CEO of the Kenyan Private Sector Alliance (KEPSA), Carole Kariuki, to answer questions from members. Cost: 3,200 KSH members, 3,700 KSH non-members. Includes 3 course lunch, water and tea/coffee. Note the date has changed from the 9th June that was previously advertised. Invitation for those members who are also members of the Confederation of British Industry to join a visiting CBI team for Breakfast. Theme: Impact of UK General Election, particularly on business. Speakers - British journalists and political commentators. Location and cost TBC. Breakfast and big screens to watch the UK General election results live from BBC1. This will take place between 0630-1000 HRS. No entry charges. BCCK Security Briefing. 0700 - 0830 hrs. Hosted by Warrior Security at their offices in Westlands. BHC staff will also be in attendance. Open to members and guests (no restrictions on nationality), no charge. Breakfast and AGM at the High Commissioners Residence. 0700 - 0900 hrs. Dr Christian Turner has kindly agreed to speak and host the AGM at the Residence. There will be a small charge to cover the cost of breakfast. Members only. Note that technically this is the AGM of the British Business Association Kenya, which guarantees the British Chamber. A networking reception was held at Air House on 23 March for the visiting Aberdeen, Grampian and London Chambers of Commerce Trade Mission, principally oil and gas but some multi sector (list here). Over 150 people attended the signing of an MOU between the British and Kenyan Chambers in the presence of the UK Foreign Secretary Philip Hammond MP and Cabinet Secretary Amina Mohamed at the Hilton on 19th March. We look forward to working more closely with the Kenyan National Chamber of Commerce and Industry and will be setting up an informal working group - please contact the CEO if you are interested in taking part. Around 50 people attended the BCCK breakfast on 10 Feb at the DusitD2 Hotel off Riverside Drive. Guest speakers were HM High Commissioners to Uganda and Rwanda and Trademark East Africa. Defence and Security Trade Mission. Sixteen defence and security companies from the UK visited Nairobi 28-29 Jan, looking for sales opportunities - and business partners (contact UKTI if you are interested in finding out more). Chamber lunch. Mr Paras Shah, from Coulson Harney, provided an overview of recent legal changes and their implications (summary here) and Lord Mandelson popped in for a chat!